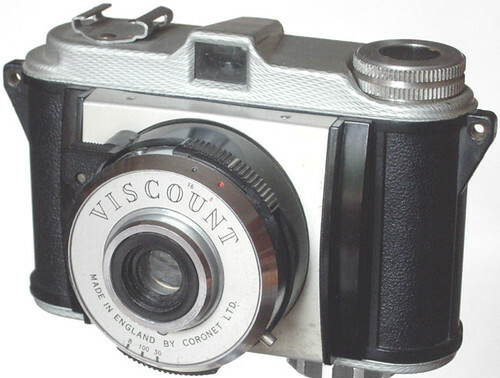 The Viscount is a fairly simple viewfinder camera made by Coronet c.1957 in Birmingham, England. It has a two speed + B shutter, 1/100 and 1/30 with flash sync via a PC socket. The unnamed single-element fixed-focus lens has a choice of two apertures, f8 and f16. The shutter release is a black triangular plastic lever on the side of the lens barrel. The body is mostly plastic, with pressed steel diamond-patterned top and bottom plates. The back and bottom plate are removable for film loading. This looks like an update of the Coronet Cub. It uses 828 film, taking 28x40mm images. This page was last edited on 24 September 2018, at 05:44.